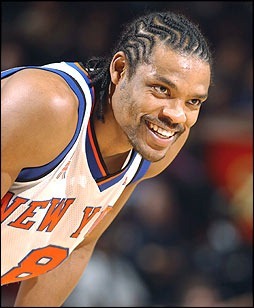 Latrell Fontaine Sprewell (born September 8, 1970, at Milwaukee, Wisconsin). Latrell Sprewell was selected at number 24 overall, in the 1992 NBA Draft, by the Golden State Warriors. He played for almost six consecutive seasons for the Warriors and I say ‘almost’ because he was fined by the NBA during the 1997-98 season – his last as a warrior – after an incident with his coach P.J. Carlesimo at one of the team’s training sessions. The incident stigmatized Sprewell’s career and followed him everywhere. He was able, however, to remain a top player in his new home at New York where he played for the last season of the 90s. He played at New York until 2003 and then finished his career playing two seasons as a member of the best Minnesota Timberwolves team I have ever seen, alongside Kevin Garnett and Sam Cassell. ‘Spree’ made his presence felt from his first season, in which he averaged 15.4ppg. in a talented Warriors team, with Chris Mullin and Tim Hardaway in its roster, that did not make to the play-offs. In the 1993-94 season, Hardaway’s injury, made the Warriors Sprewell’s team. He averaged more than 20 points for the first time in his career during the 1993-94 season (21ppg, 4.9rpg, 4.7apg.). He was named all-star for the Western Conference, a member of the all-NBA second defensive team, and a member of the the all-NBA first team. That was his best year as a Warrior, in which he played alongside the rookie Chris Webber and led the team to a 50-32 regular-season record and a first-round elimination, 3-0, in the play-offs against the Phoenix Suns, after a short but heated series of great basketball. Sprewell’s rivalry with Hardaway resulted in Hardaway being transferred to Miami in the middle of the 1995-96 season. Warriors continued playing as a mediocre team and could not reach the play-offs neither in 1996 nor in 1997, which was Sprewell’s more fruitful year (24.2ppg, 4.6rpg.,6.3apg.). The next season (1997-98) was meant to be his worse. He tried to choke his coach and was banned by the NBA. He played only 14 games that season averaging 21.4ppg. At that time, as a fan of Sprewell’s game, explosive and impressive, I thought that the NBA was very harsh and I thought it was Carlesimo’s fault that I was not going to be able to watch one the most spectacular players. Of course Sprewell’s behaviour was unacceptable and especially for the conservative NBA environment of the 90s. But, the result of the whole incident turned out to be a pleasant surprise, as Sprewell got transferred to a Knicks team that was moving from the Ewing-era with a team filled with talent (Allan Houston, Larry Johnson, Marcus Camby). This is where ‘Spree’ had his chance to advance into the play-offs, coming mostly from the bench in the short 50-games regular season. He averaged 16.4ppg. during the regular season but he exploded to 20.4ppg. during the play-offs and led the eight-seeded Knicks to the NBA Finals. I believed, back then, that the Knicks could be the first eight seed that could make it to the NBA Finals and they did. In 1998-99 the Knicks upset a great Miami team 3-2 in one of the ‘ugliest’ series ever, they destroyed, 4-0, a good Atlanta Hawks team that once more was not equipped for the next step, and surprised, 4-2, their 90s rivals, Indiana Pacers in the Eastern Conference Finals. Patrick Ewing was injured in game-2 of the Conference Finals and the Knicks went to play against the team with the best frontline of the 90s, the San Antonio Spurs of David Robinson and Tim Duncan, without their best big man. They lost 4-1 to the Spurs but Sprewell was their best player in that series, scoring 26 points per game and he came one shot short of winning the last game of the series by himself, while scoring 35 points. Sprewell played in three all-star games during the 90s and in four throughout his career. He was one of my favourite players and because of his spectacular game I had initially ranked him higher, in number 5. A comment from a fan of the blog made me realize that I was indeed overestimating him and was letting my personal preferences stand in the way of objective judgement. I believe he deserves to be the 6th best shooting that played during the 90s and I think if he had a more disciplined approach to the game he could have been an even better team-player. But then again if he was more disciplined he would not have been the player that we loved. I wish that we will have the chance see more players like Sprewell in the future.